ZENY chair mats are packed and shipped in our exclusive box that allows your chair mat to arrive rolled in a cylinder to protect the product and provide the best possible unpacking experience. Please put the carpet mat at room temperature a few hours, they are easy to unroll and lay flat by the next day. 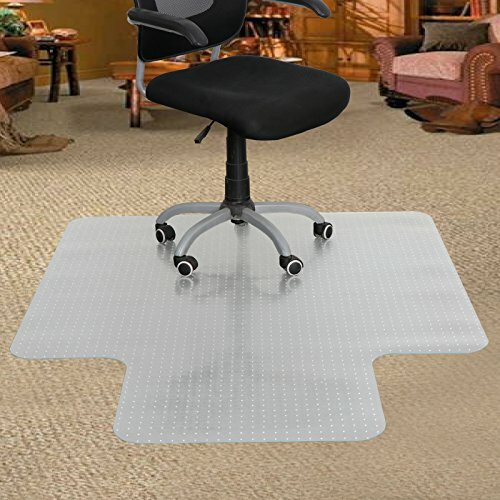 BIG SIZE PVC CHAIR MAT-48''x60'' Great size for floor protection. Suitable for carpeted floors.Slightly textured upper surface which allows for effortless gliding yet with enough grip for maximum control. View More In Computer Chair Mats (Static Discharge Control). Classic Rolla Plush Pile Carpet Beveled Edge Chair Mat Lip: Not Included, Size: 46"x 60"